Size: Same size as the common house fly, 1/8" to 1/4". 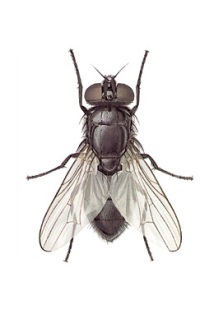 Identification: The adult fly is a shiny black fly similar to the housefly. These beneficial flies do not bother animals or people. They have little movement or flight, unlike house flies. Biology and life cycle: Females lay an average of 170 eggs over a seven- to ten-day period. Eggs hatch in eighteen to twenty-four hours. There are three larval stages and a pupal stage, which changes into an adult fly. Adults mate after about five days; two days later, the females start laying eggs. The egg-to-adult period is about fourteen days or shorter. Habitat: Like dark locations and stay close to the ground. Love manure pits. Feeding habits: The larvae (or maggots) are predators of the larvae of house flies and other flies. Economic importance: Control of house flies resulting from animal manures.